Want to publish your book and market it like a rock star? Want to learn what it takes to earn income as a writer? 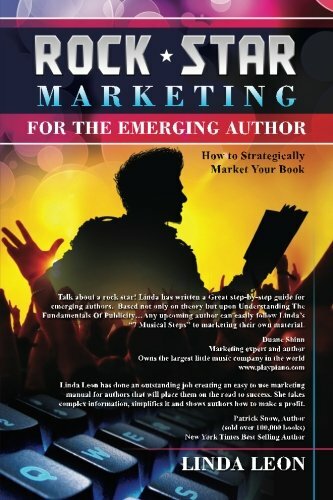 Rock Star Marketing for the Emerging Author is a road map for strategically marketing your book. In seven simple steps learn how to go from print to profit. Unlike most marketing books, Rock Star actually provides exercises that will help you to begin marketing as you are reading the book. Instantly applying concepts helps seal the marketing techniques in the author&#x2019;s memory. Rock Star Marketing equips authors with the tools needed to become seasoned and potentially very profitable authors. In this book Linda Leon presents a step-by-step approach to maximize your marketing efforts. She candidly shares from her personal author&#x2019;s journey. Linda Leon is a ghostwriter and book marketing consultant. She was also a columist for UPI. Her company Book Marketing Professionals helps authors with book promotions and visual productions. She loves podcasting on her show Book That Author, is an avid reader and loves her dog and family. Not necessarily in that order! Most of all loves God.